Praying for Genelle over these last couple weeks, I would sometimes hear these words echo into my heart. Now that things are beginning to settle down into my spirit I can hear them again. And as if by some God whispered nudge, my friend Danielle posted these words on instagram and they boldly stared me back in the face. I believe it with every part of me. 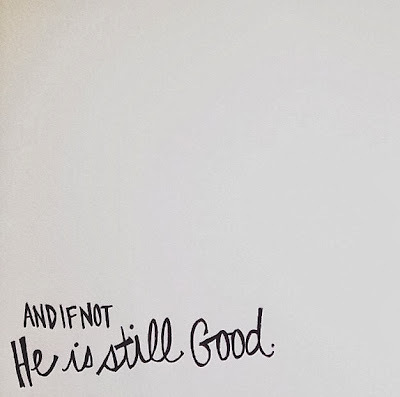 That He is still good. That He is good. That He knows far beyond what I could imagine and even try to think I know. It's silly really, for me to even question. And yet, I know that God's ok with my questioning. I remember a moment sitting in my car, right after we lost Faith. I had a lot of anger. I wasn't mad at God. I never have been. But I was just angry. I felt like my fight for her wasn't good enough. Like I had done all I knew to do, and still I failed. And I remember this moment in my car so clearly where I began a hard conversation with God where I pushed for answers and I kinda felt Him push right back. Like it was ok. You know I think when we push, we move forward, and I felt myself moving forward. Changing. I remember feeling distinctly that it was a pivotal moment and that in my anger I could either stay right where I was, or I could allow my faith to literally be catapulted to another level. I never want to stay where I am. I want to move forward and grow, change and transform. Thats my hearts desire. So when something comes at me and it challenges me, you'd think I would welcome it. But thats just not human instinct. Instead, emotions take over and our flesh rebels. What we wanted didn't happen. We didn't get what we wanted and that makes us angry. But if we choose to move past that emotion, there is so much more beyond it. I can feel it now too as I push forward, my heart and faith have grown. I believe with all of my heart that God is good. And that He is able. And that His ways are not my own. I truly do. And so in that I rest. I don't have the answers. I have Him. And that is enough. -And If not- Still I will praise Him. this makes me think of Shane and Shane 'though You slay me.' - right now my heart is nearing that place where i can fully be okay with the 'if not' although it's so painful sometimes and i have a good way to go, so this was refreshing and encouraging to read. it helped my soul. It's sooooo hard to let Him be in control of everything. But you are right. 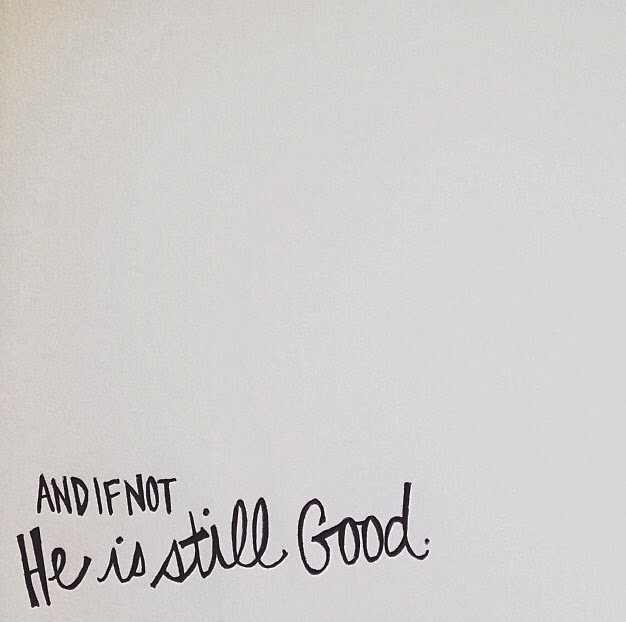 Even if things don't go your way, they will go His and He is still good. This is truth. And I love it. Thank you for your honest and vulnerable words. I think it's good to have these "wrestling' moments with God and dialogue with him our questions, pain, anger. I really believe it's in these moments were we can find freedom, peace, and move forward. Love your blog!! Bless you. You are so wise. Have so much heart and knowledge. You inspire me to push forward too. Thank you for your openness, yet again.